This page describes the Triassic Period, including stratigraphy, paleogeography, and famous lagerstätten, followed by a sketched outline of some of the major evolutionary events. During the early part of the Triassic Period, much of the world was arid, becoming cooler and wetter towards the end. Popular interest in the Mesozoic is largely focused upon the Jurassic and Cretaceous and essentially preoccupied with crown group dinosaurs. The interesting evolution, however, mostly occurred deep in the Triassic. By the end of this period, dinosaurs, pterosaurs, lizards, mammals, and possibly even the earliest birds, had all evolved from Permian stock. The mass extinction event which marks the Permian-Triassic boundary is discussed elsewhere. Stratigraphically, the boundary is defined at the first occurrence of the conodont Hindeodus (al. Isarcicella) parvus within the evolutionary lineage Hindeodus typicalise – H. Latidentatus praeparvuse – H. parvuse – H. postparvus as the primary correlation marker for the base of the Mesozoic and Triassic (Gradstein et al. 2012, p. 683). “The end-Triassic mass extinction terminated many groups of marine life, including the conodonts, whose distinctive phosphatic jaw elements constitute a primary zonation for much of the Paleozoic and Triassic, and the majority of ammonoids. Indeed, in the few regions with continuous deposition there is an interval devoid of either typical latest-Triassic taxa (e.g., conodonts or Choristoceras ammonoids) or earliest-Jurassic forms (e.g., Psiloceras ammonites). A sea-level fall produced extended gaps in many shallow-marine sections; therefore, the boundary between upper Triassic and the overlying lower Jurassic was commonly a sequence boundary and hiatus” (Gradstein et al. 2012, p. 733, and references therein). The GSSP for the base of the Jurassic is set at 5.80 m above the base of the Tiefengraben Member of the Kendelbach Formation, corresponding to the local lowest occurrence of the ammonite Psiloceras spelae subsp. tirolicum, in the Kuhjoch section, Northern Calcareous Alps, Austria. Other useful markers include the FAD of Cerebropollenites thiergartii (a pollen grain), Praegubkinella turgescens (a foraminifer), and Cytherelloidea buisensis (an ostracod) (see Gradstein et al. 2012). The Triassic Period spans the interval from 252.17 ±0.06 to 201.3 ±0.2 Ma (Cohen et al. 2015). Paleogeographic reconstruction for the Triassic from Christopher Scotese’s excellent ‘Paleomap Project’. 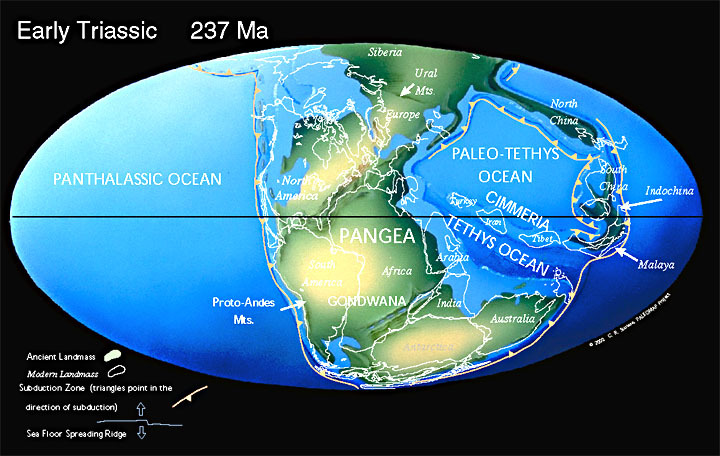 During the Triassic, the Earth “was much warmer, and because Pangea was centred on the equator, half the land was always scorching in the summer while the other half was cooler in the winter. These marked temperature differences fueled violent ‘mega monsoons’ that divided Pangea into environmental provinces characterized by varying degrees of precipitation and wind. The equatorial region was unbearably hot and muggy, flanked by subtropical deserts on both sides. The midlatitude regions were slightly cooler and much wetter” (Brusatte 2018, p. 21). The large terrestrial animals living at the end of the Permian – “an exotic menagerie of large amphibians, knobbly-skinned reptiles and flesh-eating forerunners of mammals” (Brusatte 2018) – were decimated by the end-Permian mass extinction. The generally small creatures which survived into the Triassic underwent rapid radiation from which arose modern lineages of amphibians, reptiles and mammals, as well as the dinosaurs. The earliest unambiguous dinoflagellate fossils are Triassic in age. Like most microscopic fossils, the dinoflagellates have a rather low profile with the general public, but they are important for Mesozoic and Cenozoic biostratigraphy. Triassic vertebrates were dominated by two different amniote clades: the Synapsida and the Archosauromorpha. The Synapsida, which includes mammals and their close relatives, were the most abundant and diverse of terrestrial vertebrates. Non-mammalian synapsids were extremely abundant during the Early and Middle Triassic, although the true mammals are not known until the Late Triassic. By the end of the Triassic Period, dinosaurs, pterosaurs, lizards, mammals, and possibly even the earliest birds, had all evolved from Permian stock. A Triassic origin for the angiosperms? Cohen, K.M. ; Finney, S.C.; Gibbard, P.L. ; Fan, J.X. 2015: The ICS international chronostratigraphic chart v 2015/01. Episodes 36: 199-204. Gradstein, F.M. ; Ogg, J.G. ; Schmitz, M.D. ; Ogg, G.M. 2012: The Geologic Time Scale 2012. Elsevier 1-2. Ogg, J.G. ; Ogg, G.; Gradstein, F.M. 2008: The Concise Geologic Time Scale. Cambridge University Press: 1-177. Parrish, J.M. 1997: Triassic Period. In Currie, P.J. ; Padian, K. (ed.) 1997: Encyclopedia of dinosaurs. Academic Press: 747-748.